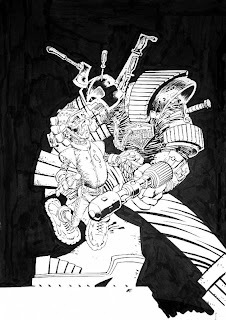 2000AD Covers Uncovered: Ben Willsher - The Art of Lenny Who? Ben Willsher - The Art of Lenny Who? A warm welcome back to the prog for super artdroid Ben Willsher! 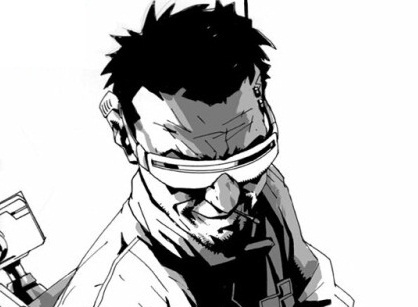 Ben is easily one of the best artists working in 2000AD today, his knowledge of 2000AD lore and Mega-City history is vast and he always enhances his incredible artwork with in-jokes and Easter Eggs for the fans. His artwork exudes cool so it's no surprise that he was hand-picked by writer Andy Diggle to replace the mighty Jock on the brilliant Lenny Zero strip. "It's all about the Griffins... geddit? Like It's all about the Benjamins.... ah fageddit!!!! ;-) Ok, here it is... The story of the Lenny zero cover." "This cover was drawn straight after I had finished part one of Lenny Zero, and Tharg said he wanted an image of Lenny and Shuggy together. He sent me this image of Han Solo and Chewie as a good starting point for the direction we should go in..."
"I loved this idea, but I wanted to get some elements of the story in there, too. 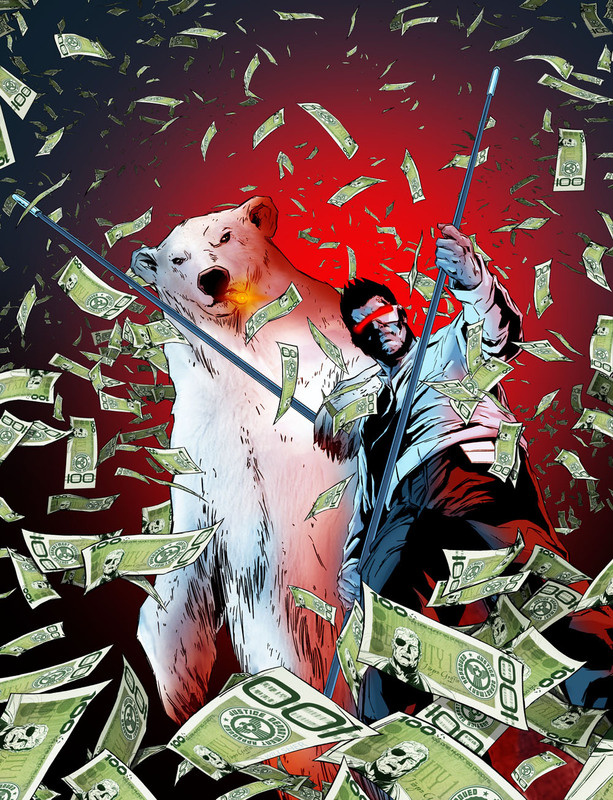 So I roughed out an image of them both being surrounded by falling money, which I felt was a more symbolic image of the story arc." "Tharg approved this, so it was just a case of getting on and drawing the thing." 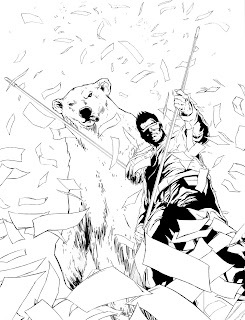 Very cool inks for a very cool cover! "Now, I'd drawn the falling money, so this meant I actually had to design the creds themselves. There's never been a definitive version before, but there were a couple of versions I'd liked over the years. 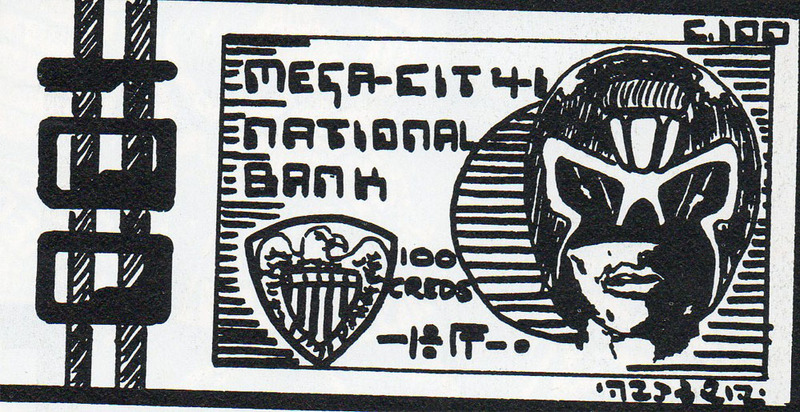 The first being Brett Ewins' design in the 2000ad Annual 1979, but you could only see the top end of the bank notes. 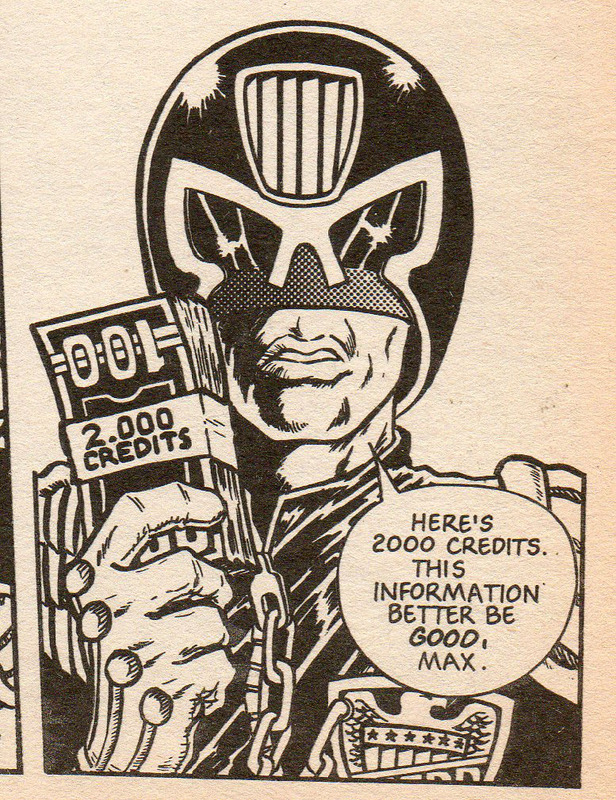 The second was in the Judge Dredd Annual 1983, in the Readers' art section and that had a more fully fleshed out design of the note. Obviously, this had been largely based on the Ewins' version by Adrian Franks, of Lorshill, Southampton (where is he now? ), but it had always impressed me, so I thought it was worth using it as a footprint for my own take on the note." Adrian Franks' famous(!) 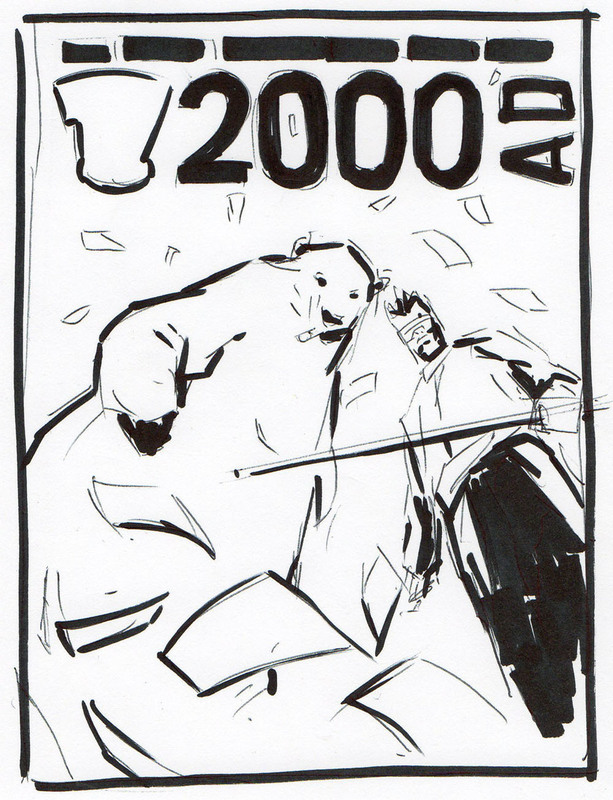 hundred cred note. Where is he now? "So I set about designing the new look note - I took two real bank notes as further inspiration: The 100 dollar bill, and the long departed pound note. I love the pound note, and I was genuinely gutted when it was taken out of circulation in favour of the pound coin (PAH!). 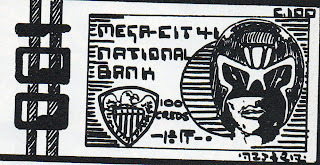 I felt it had the right shade, tone and colour to be a basis of my new design..."
"The one thing that is noticeable about bank notes in general is they all have the face of someone that is hugely influential to that nation, so why would would Mega-City's currency be any different.... but who to choose?" "It had to be a Chief Judge, and Judge Griffin seemed the obvious choice to me as visually he is the most striking. Problem was I wanted to put his full name, but unlike Francisco, Hershey, Silver, Volt, McGruder, Goodman, Solomon or Fargo, he didn't have a first name. 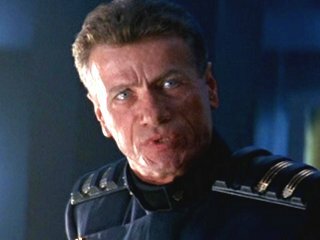 So I had to pick him one, and who better to name him after than Jürgen Prochnow, the man that played him in the Stallone Dredd movie. Hopefully that is now Canon ;-)"
"I say we extend execution to include lesser crimes!" "Something that Andy (Diggle) and I worked out is that lower notes like the 100 Cred bill would be like traditional bank notes, whereas as they get higher in denomination (for example 10,000 creds) they would become smalled and more like credit cards." 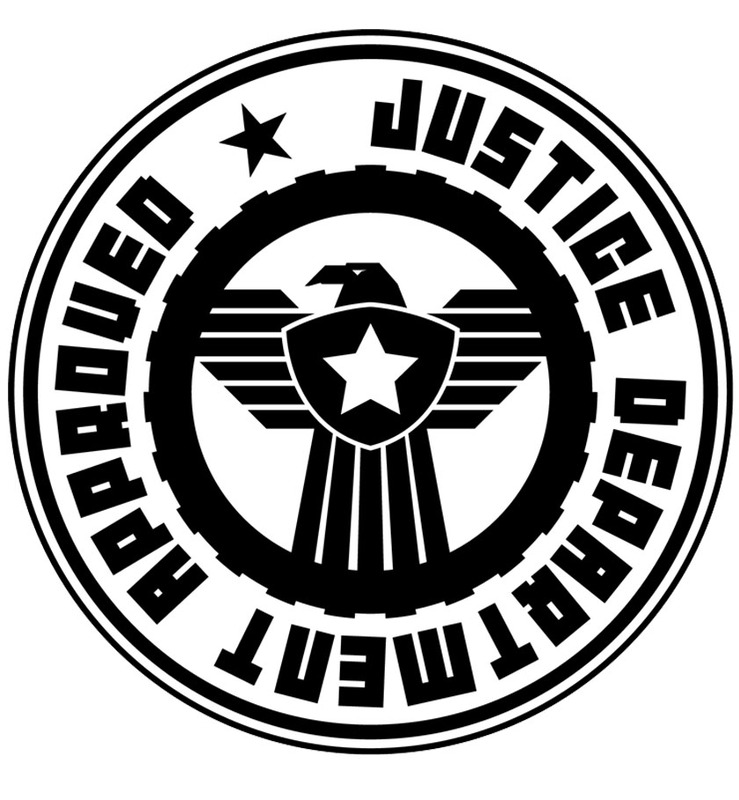 "A finishing touch to the note was the addition of the 'Justice Department Approved' stamp created by the brilliantly talented nerve centre designer Simon 'Pye' Parr- So extra thanks to him." "And here's what the final image looked like..."
"All I had to do then, was warp it into the image about a 100 times and colour the whole image. TA DA!..." And there it is, another winner from Willsher! It's phenomenal how much work he put in to those bank notes, let alone the rest of the cover! The artwork in strip is excellent too, with cameos from Stookies, Shako and Judge Pal and the inclusion of Satelats, Shuggy tables, sumps and more, excellent! 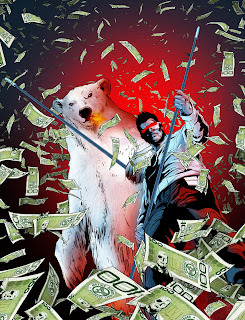 The finished cover, money, money, money! The Prog as it appears on the shelves. Thanks a million to Ben for sending those brilliant pictures and, of course, for the fascinating words, it's almost scary how much he knew about creds! Hmmmmm, I wonder what did happen to Adrian Frank is!?! The story of Lenny Zero's origins are almost as intriguing and complicated as the wily character himself! The following story has been told often, but it's worth telling again! Writer Andy Diggle was assistant editor of 2000AD and editor of the Judge Dredd Megazine as it was heading for it's milestone ten year anniversary issue. Despite the very tight editorial budget Diggle was keen to get Goddamn superstar artist Frank Miller to draw the celebratory cover. So, in an act of complete selflessness, Andy wrote a cool as der cucumber ten page script for free, using the money saved to fund the landmark cover. 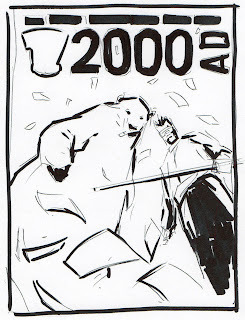 Art duties were picked from 2000AD's ever growing slush pile; one artist had really stood out in Andy's mind, a massive talent known as Jock. The artist was asked to illustrate the strip and a creative tour de force was unleashed! As many will know, when Miller's cover actually arrived it was an absolute train wreck. The editorial team expressed their disappointment to the artist who asked for the work back and (thankfully,) it was never published. 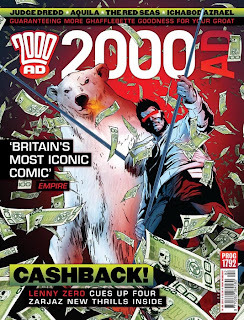 Still, every cloud has a silver lining and from this awful cover a seriously cool character was born as well as one of comics' most fruitful and successful partnerships! Here's a recap of Lenny's story so far. 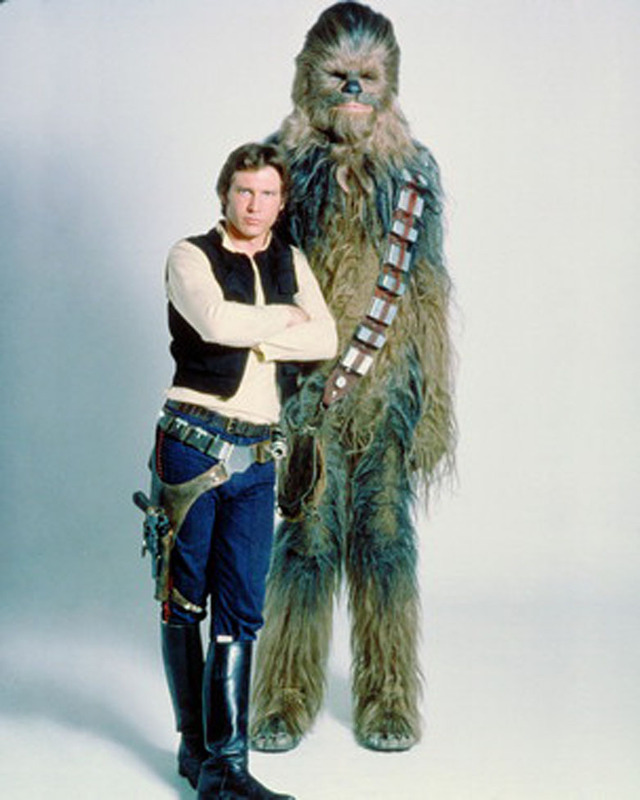 Lenny's eponymous début strip introduced us to the crafty Wally Squad judge who wanted out of the force. Lenny's true identity is discovered while working undercover to take down mob boss Caesar Piccante, an abrasive two hundred year old gangster who's personality is biochipped into the body of a ten year old body. The quick talking scoundrel promises to use his judicial credentials to spring Caesar's captured accountant from an interrogation cube, saving his thirty million cred fortune. Lenny liberates the accountant, however this is a Justice Department sting to try to finally implicate Caesar as mob boss and take him down. While racing away from the cubes, Zero tricks the accountant into giving him Caesar's account details before leaving him and a justice department tracer on an automatic refuelling platform. You can read Andy's fantastic script for this fine story here. A body bearing Lenny's ID card is pulled from a chem pit, the very flesh burned from it's bones and the skull blown apart by a mob laser blast. An obsessed SJS Judge Kramer demands a full autopsy and discovers that the body does not belong to Zero and he has tried to fake his death to escape the justice she is so desperate to give him. Very much alive, Lenny has assembled a group of dangerous master criminals to go after a star freighter carrying forty million creds worth of grade A Umpty Candy at JFK Space Port. As Lenny retires to one of his many safe houses, he comes face to face with Justice Department retribution in the form of a seriously grim Judge Dredd. The heist is on! Lenny, disguised as a judge, leads his squad to the Space freighter. They board the ship only to be confronted by Trapper Khan and we discover the details of Lenny's plan. He has double-crossed his entire gang, trading their freedom for his, ensuring a massive reward for Khan's captives. Lenny has returned to life of crime in the Big Meg, wiping and re-chipping credit cards and selling them to the mob. 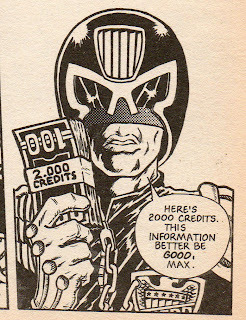 During a deal, one of the goons recognises Zero as the judge who ripped off Little Caesar. Using his wrist mounted guns, Lenny mows down the gang but not before one of the thugs gets the message to Piccante, "Lenny Zero is aliv-"
Lenny tries to appeal to Caesar's better nature, telling him about his stolen childhood, his life as a judge and how he'd fallen in love with a lie. Lenny wants to wipe the slate clean and allow both parties to walk away before they kill each other. Unfortunately Ceasar doesn't have a better nature and he refuses. Lenny uses his EMP-based credit-wiper to wipe the mob boss' biochip, erasing any memory of Zero or the trouble he'd caused. So there ya go, all you need to know about Lenny Zero! Thanks again to the brilliant Ben Willsher for taking his time to send the images and commentary! Hi. I am Adrian Franks. Was amazed to see my artwork from aged 12 being referenced in this amazing cover. Now running my own design studio - Creative Wisdom - near Romsey in Hampshire. Did not know my 100 cred note was 'famous'. Wow Adrian! SO pleased you saw it! Lee Garbett - Corps Blimey Guvnor! Leigh Gallagher - Aquila... it makes me happy! 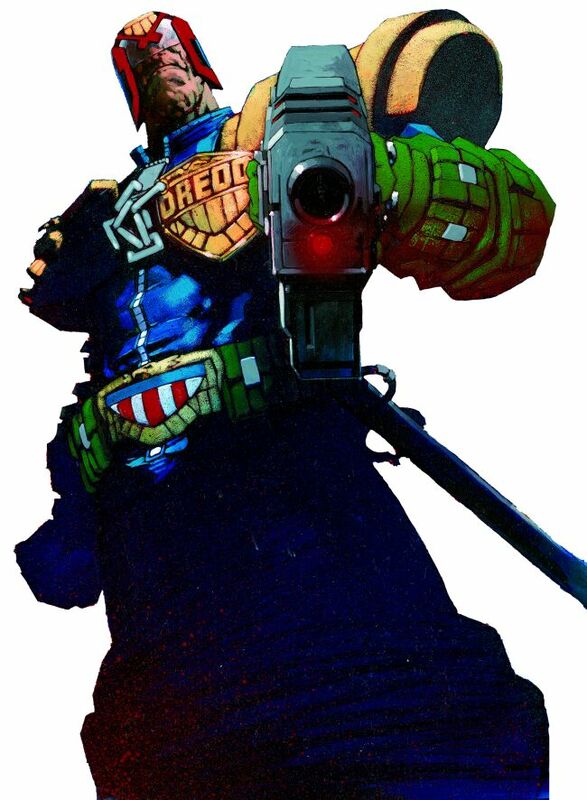 Greg Staples - Dredd 3D Cover Uncovered! Drokk! 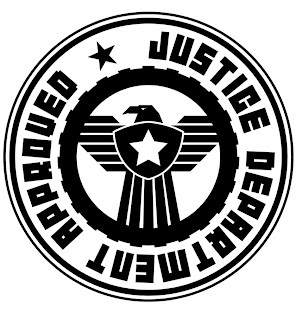 First BRUTAL clip of Dredd! Carlos Ezquerra - Hot Dog!